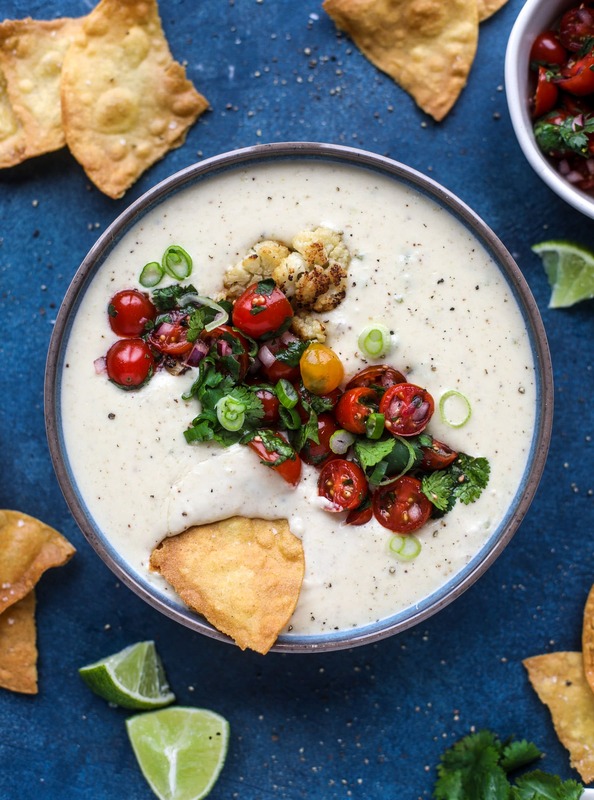 Yes you’re seeing this… roasted cauliflower queso is a real thing! But this? It’s legit to die over. If you are a fan of cauliflower, I’ll meet you in queso heaven. Side note: that’s the roasted cauliflower up there. The shade shows the caramelization from roasting and you might want to eat it with a spoon. If you have a copy of The Pretty Dish, or heck, if you follow along on Instagram, then you probably know that I have a recipe for butternut squash queso and that I loooove it. You guys also love it! Like I want to make it all the time during squash season. Oh! You can find me making it in the highlights on Instagram. It’s a great recipe. Cauliflower queso seemed only natural, but it wasn’t my idea at all. Lacy mentioned it last week and it sounded so so good to me. Roasted cauliflower was one of the first vegetables I started to enjoy (it kind of tastes like popcorn! Right?) and the idea of making a cheesy dip with it? Sold. I didn’t need any convincing. If you’re looking for a delish recipe this weekend for the Super Bowl, let this be it! Or, head here for over 100 others you may love. I can tell you for sure that this will be on our table. Pretty sure that I like this cauliflower queso better than the butternut queso. Here’s the thing. The butternut queso is incredible but it’s very fall-tasting and at this point in the season, I start to get a bit squashed-out. The cauliflower queso takes on a lot more of the roasted flavor. That contributes to my love too. p.s. we made the rustic tortilla chips recipe from my book, but any chips will do! This is a queso for cauliflower lovers. We don’t replace anything with the cauliflower. We simple add the cauliflower to the queso. Yes, since we have cauliflower (a vegetable! Yay!) in the queso, there may be less milk or cheese, but it’s not a cauliflower replacement dish! It’s for those of you that loooove this cute little crumbly veg. It is a cheese dip, and it is melty and creamy and you’ll get a few delicious cheese pulls when you dip a chip. But it’s not 100% smooth. It not gritty or lumpy either though, as long as you pulse it a bit. It’s slightly thicker like the butternut squash queso. If you’ve made that, you’re probably familiar with the texture. You really don’t have to roast the cauliflower if you don’t want to, or if you’re in a rush! You could even buy the pre-riced cauliflower at your grocery store. And you don’t have to puree it if you don’t want to. There will be more texture if you don’t, but it will still taste good. I personally love the roasted, slightly caramel flavor that comes from the oven. This queso is also made with charred poblanos. I added in the extra step of charring them on my gas range (so profesh) and steaming them, but you can throw them in with the onions. As a result, this has so much flavor. You won’t be able to stand it! In the event that you need a cheesy dip to warm up this weekend? I’ve found it. This roasted cauliflower queso has all the deliciousness of regular queso, with roasted cauliflower added in. It's satisfying and tastes like heaven. Preheat the oven to 425 degrees F. Line a baking sheet with parchment or foil. Place the florets on the sheet and drizzle with olive oil. Sprinkle with salt and pepper. Roast for 20 to 25 minutes, until slightly golden. Reserve a few florets for topping the queso, but transfer the rest to a food processor. Pulse and blend it until combined and smooth. You can make it as smooth or chunky as you’d like, but remember the texture will be that way in the dip! While my cauliflower roasts, I char the poblano on my gas range and stick it in a bag to steam. After 20 minutes, I remove it, peel off the skin and chop it. I love the result of this pepper, but you can always chop it raw and sauté it with the onion! Heat a saucepan over medium heat and add the olive oil and butter. Stir in the peppers, onions and garlic. Season with the salt and pepper. Cook until the onion softens, about 5 to 6 minutes. Slowly stream in 1 cup of the half and half, whisking the entire time. In a bowl, whisk together the remaining 1/2 cup half and half and cornstarch until no lumps remain to create a slurry. Stir the slurry into the saucepan and cook for a minute until the milk thickens. Reduce the heat to low. Stir in the grated cheese one small handful at a time, until melted. Stir in the cauliflower puree until combined. The color may darker slightly or look a little speckled. Taste the mixture and add a sprinkle of salt and pepper if necessary. If it gets super thick (this can happen if your heat isn’t low), you can always whisk in a bit more milk. I’d start with ¼ cup. Transfer the mixture to a crock, larger bowl or a small crockpot heating on low. Top it with the leftover roasted cauliflower, along with anything else you may have. I love adding on some quick pico and a handful of cilantro or green onion. Serve immediately. This will need to be stirred a few times as it sits. It’s best when kept over low heat. It is thicker, so it doesn’t drizzle beautifully, but it is amazing ON dish, like nachos and tacos and taquitos! Who knew a bowl full of cheese could work so much magic. And here I thought the infinite ways of using cauliflower wouldn’t expand any further…. now this queso recipe. Love it. Oh my goodness! I want to dive right in! This is genius! This look delicious. Thought it may have been vegan. I may try this with my cashew milk cheese. cannot stop thinking about this! seriously so good. This reminds me of the butternut squash queso from The Pretty Dish, which I LOVE! Cannot wait to try this!!! Excited to try this….can it be made a day ahead of time and reheated? Or is it better fresh? Got all the ingredients ready to make for our Super Bowl spread! it is best fresh, but i reheated it for days!! if you add a little milk when reheating, it’s great. how did it turn out jen?! My husband is black and white on texture. Dips should be creamy and smooth. He’ll forgive chicken or sausage, and maybe some garlic, but I don’t think cauliflower. Have you tried pureeing this? I’m making this today for the Superbowl. Super excited to try it! I’m going to add black beans to it so I hope it pairs well! Wish me luck! We did!!! I didn’t end up putting the black beans in but I did add a jalapeno to give it more heat. I also think the head of cauliflower I had was a little too big but it was still delicious! I can’t wait to try the butternut squash queso. Super good, just made today. I had riced a bunch of cauliflower and roasted it in the oven. It so good! You don’t even taste the cauliflower at all. i have sucked st making quest my whole life. this made it so easy. and damn delicious. this looks INCREDIBLE! love love love cauliflower. and with cheese? come on! can’t wait for a pot luck to do this one. I can’t wait to try this! Could this be frozen and prepped ahead of time?